For most applications with pipeline sizes less than 2” (50mm), the Inline Adapter is suggested. This adapter is available with either flanges or NPT couplings and allows the MPR E-Scan sensing head to be installed directly in the pipeline. The internal design of the adapter ensures that the process is forced directly on the sensing head prism for an accurate reading. The suggested orientation of the sensing head is on a horizontal plane for a horizontal segment of pipe. A vertical segment of pipe is also acceptable if the flow is in the upward direction. A cleaning purge tube is standard unless specified otherwise. 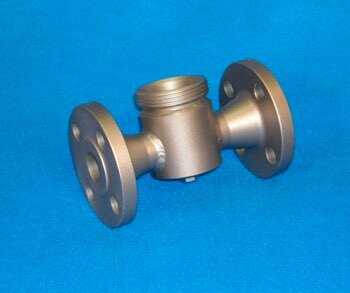 These adapters can also be manufactured from a variety of exotic materials.